Mr Whirly is very excited to present you ten new wines from his recent trip to Sicily in May this year, from the small “Cantine Gulino” in Siracusa, where the boot of Sicily kicks the football of Sicily and the place where civilisation was born in 800BC, we have an abundance of grapes specific to this small wine region; then from Castelvetrano, famous for its olives as well as its vines that are very close to Port Palo, an old destination for myself, Simon and Becky Thomas and Bob Parkinson ( Owns ” Food by Bob” in Cirencester) from a few decades ago, since it has a great beach and restaurant called ” Vittorio’s”, we have some delicious low alcohol wines that offer wonderful value for money for the 750ml bottled Vermentino and Syrah as well as “Bag in Box” Cattarato and Syrah-Nero D’Avola from only £8.25 a 750ml bottle. 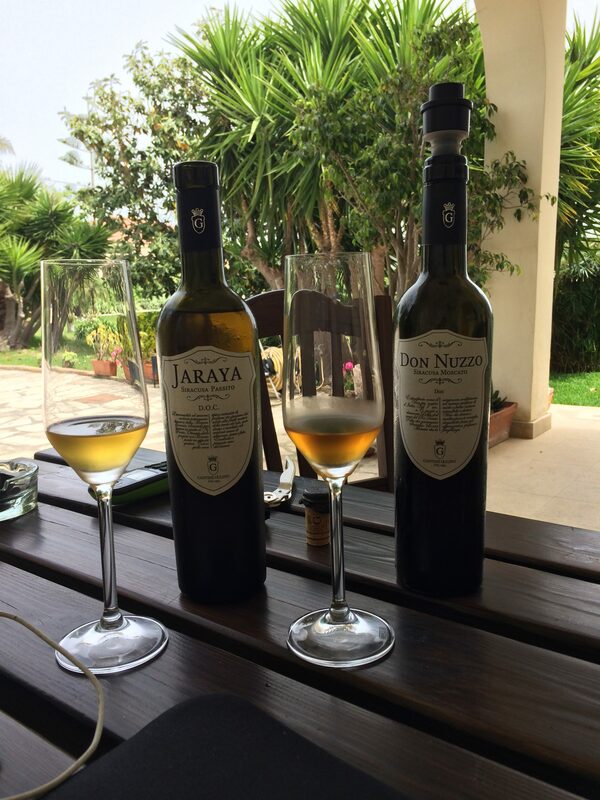 Pictured at the bottom of this post, the very special “Moscato de Siracusa” wines ( ” Don Nuzzo” and ” Jaraya”) from this vineyard, grapes that are specific to Siracusa, sun dried off and on the vine and pure deliciousness in a glass, full of fresh figs and apricots. Then we have the ” Pretiosa” label, 100% Albanello, another grape specific to this delightful town, this wine had really interesting palate of ripe Melon and Mediterranean sea salt and would be perfect with Scallops or some other shellfish. “Cantine Gulino” are the only producer that make the Albanello grape in a single varietal wine. Its beautifully different, therefore a great ” Whirly wine”. The Next white is ” Fania” a gorgeous Aperitif style wine, blending Fiano from Napoli and the ” King of Grapes from Sicily”, Insolia, to make a summer flower wine perfect as an Aperitif wine and with a light lunches. On a recent wine tasting tour with restaurant clients in Scotland and Wales this wine was the most popular of the white wines we tasted. Two reds wrap up this array of wines, the ” Fanus” which is an un-oaked wine, Nero D’Avola and Syrah, very earthy and natural in its style, very much a wine that allows both grapes to express themselves as they are and the “Dru’s”, 100% Nero D’Avola, the main red grape of Sicily and again the home of which is here; 12 Months on oak and seriously big yet refined juice. The reason why I am writing about these wines is because of this wine, tasted in London in January and now imported to the UK 6 months later. Buy it and enjoy it. Needs a nice steak or possibly Grouse, now that they are in season. another great find, since its extremely rare to find a Syrah at only 12.5% Alc vol. It has hints of white pepper spice, but the colour and taste is more like a richer Pinot Noir to be honest. It also had some lovely spiced berry fruit, cherries and blackberries and really expresses itself very brightly and happily. Then the find of all the wines at the moment in your local SW17 wine shop is the Nero D’Avola and Syrah from Cantina Gulino out of the ” Barrel”, another light wine in colour and alcohol at 12.5% alc vol, simply bright red cherries in a glass and quite the most deliciously drinkable wine you will find in London at the moment at £8.25 a bottle. Their Cattarato- Trebbiano out of the barrel is pretty damn good too, at the same price, spicy stoned fruit wine, clean and zingy and so easy to drink. So Whirly wine now serves 5 wines for you from the barrel at an affordable price of under £10 a bottle so please come in, taste before you buy and there are not many wine shops you can do that in whatever city you are living in around the world, and support your local wine business. I am not in anyway expensive, no one can say that of Whirly wines and yet the quality of the wine, I can guarantee you, will far surpass anything from my supermarket friends around each corner of Ritherdon road. So come into your local wine business, support Whirly wines NOW….